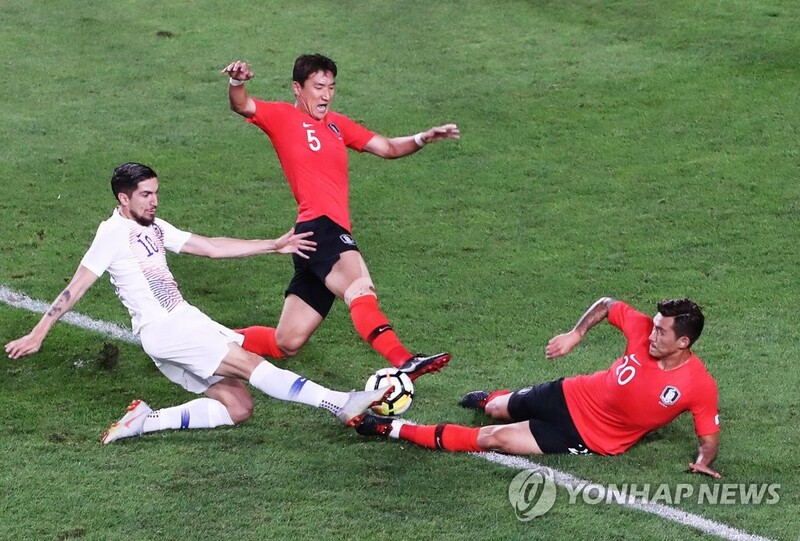 SUWON, South Korea, Sept. 11 (Yonhap) — South Korea held Chile to a scoreless draw in a men’s football friendly match at home on Tuesday, staying undefeated in two matches under new head coach Paulo Bento. The teams traded few dangerous scoring chances in a tight match at Suwon World Cup Stadium in Suwon, some 45 kilometers south of Seoul. South Korea were coming off a 2-0 win over Costa Rica last Friday, but Chile, ranked 12th in the world, presented a whole new challenge for 57th-ranked South Korea. Led by FC Barcelona stalwart Arturo Vidal, Chile dictated the pace in midfield, quickly closing in on South Korean ball carriers before they could mount attacks. A quick transition and a rock solid back line also allowed Chile to foil the few attempts that South Korea had inside the box. Bento made three changes to the starting lineup from last week, one of the new faces being goalkeeper Kim Jin-hyeon making his 16th international appearance. And Kim had some misadventures with his clearing attempts and dodged a couple of bullets in the first half. In the 17th, Kim’s kick intended for a teammate went off a Chilean player in the box, but South Korean defenders scrambled to clear it out of harm’s way. Only about four minutes later, Kim kicked one right to Diego Valdes, who almost seemed surprised to have the ball land at his feet and couldn’t quite corral it in the box. But in between those near disasters, Kim made one fine save, a diving stop on Angelo Sagal in the 18th minute after the Chilean forward cut in from the right wing and shot one from the center of the box. Vidal sought to assert himself on offense in the second half. He launched one just over the bar from the top of the box in the 57th, and misfired on a volley in the 63rd after Mauricio Isla’s cross went off a South Korean defender and floated to the wide-open midfielder. Defender Jang Hyun-soo had South Korea’s best scoring chance in the 68th, when he headed down a Son Heung-min corner kick and had it bounce only inches wide of the right post. Jang’s mediocre clearing attempt almost cost South Korea at the other end in the 75th minute, when Valdes pounced on it with a volley that sailed over the crossbar. Ki Sung-yueng found a shooting lane for South Korea from the left edge of the box in the 83rd, but his right-foot shot was parried aside by the diving Gabriel Arias. Valdes missed on one final chance to get on the board, as he missed a gaping net following a South Korean turnover. Though they had trouble generating much on offense for most of the match, South Korea managed to outshot Chile 3-2 thanks to a late push. The hosts played before a sellout crowd of 40,127 fans at the stadium affectionately called Big Bird. 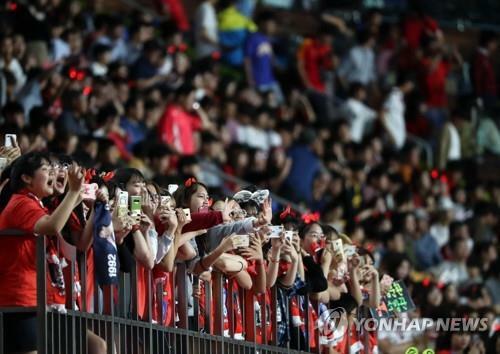 It was South Korea’s second consecutive sellout, after drawing a little more than 36,000 fans at Goyang Stadium against Costa Rica.